Pinks Dudley is pictured at a family selection intake meeting with children from some families applying for a Habitat for Humanity home in Starkville, MS.
Family selection intake meetings are held to inform applicants about the application procedure for a Habitat home. Applicants are helped with any questions they may have about filling out the application. This is the first step in the application process. Family selection intake meetings are held at various times of the year. Check with the Habitat office 324-7008 for dates and times of meetings. Waldrop Chiropractic Clinic volunteered to work on Miss Annie’s new house. The Resale Store is open the first and third Saturday of every month from 8:00-11:00 a.m. It is located at 1632 N. Montgomery Street- it is the blue metal building on the east side of N. Montgomery, just north of the Bypass. If you are interested in donating building materials, furniture items, used lumber (without nails), appliances, etc. which are in decent/working condition please contact the Habitat office at 324-7008. A donation voucher is provided for tax purposes. MSU’s Office of Fraternity and Sorority Life recently donated $75,000 for a new Starkville Area Habitat for Humanity home. Presenting a check to the committee recently were (l-r) Stevany Jackson; John Michael VanHorn, fraternity and sorority life assistant director; Jacqueline M. “Jacqui” Posley; Grace Wegener; Haley Watters; Grace Mangrum; Yeager Bass; Emily Ann Kirkland; Ja’Syon Charles; Jeremy Knott; Jackie Mullen, director of student activities; and ShirDonna Lawrence, fraternity and sorority life coordinator. STARKVILLE, Miss.—Within a year, a Starkville family should be moving into a Habitat for Humanity-built home made possible with support provided by Mississippi State’s fraternities and sororities. University fraternity and sorority members recently completed a fundraising campaign that raised $75,000 in donations. John Michael VanHorn, MSU fraternity and sorority life assistant director, said he anticipates the construction project becoming a yearly partnership with the Starkville Area Habitat for Humanity program. Work on the building is expected to begin in September, with dedication of the residence taking place mid-spring, he added. VanHorn emphasized that service is a cornerstone of Greek organizations. Fund-raising and home construction projects such as this provides fraternity and sorority members with special opportunities to leave a lasting impact on the community, he added. “Our fraternities and sororities pride themselves on their various philanthropy and community service efforts, and this is a great way for our students to interact with each other while giving back to the community with one specific project,” said VanHorn, an MSU alumnus. Joel Downey, Starkville Area Habitat for Humanity executive director, said home ownership is key both to personal financial stability and community development. In addition to assistance from numerous campus and community volunteers, Downey said his organization is grateful for the annual support of covenant partners like MSU’s Kappa Sigma fraternity. As part of their Charity Classic football game, Kappa Sigma members have donated $20,000 each of the past five years to the Starkville Area Habitat for Humanity program, he noted. To donate to this Starkville Area Habitat for Humanity project, visit www.habitat.greeks.msstate.edu or mail a check in care of Fraternity and Sorority Life, P.O. Box 5368, Mississippi State, MS 39762. 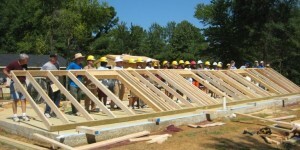 For more information on MSU fraternities and sororities or the new Starkville Area Habitat for Humanity project, visitwww.greeks.msstate.edu. To contact the fraternity and sorority life office, telephone 662-325-3917. VanHorn also may be reached at jvanhorn@saffairs.msstate.edu. Learn more about Starkville Area Habitat for Humanity by visiting www.starkvillehabitat.com, telephoning 662-324-7008 or emailing hhumanity@bellsouth.net. MSU, Mississippi’s flagship research institution, is online at www.msstate.edu. The donation will help build a Habitat for Humanity house for an Oktibbeha resident.